I’ve become quite fond of black beans. I’ve starting substituting them for kidney beans in chilli con carne, fajitas and other Mexican favourites. Also, one of my favourite Madhur Jaffrey recipes is a South African red kidney bean curry; it’s a simple but amazingly delicious recipe that impresses me every time I make it. 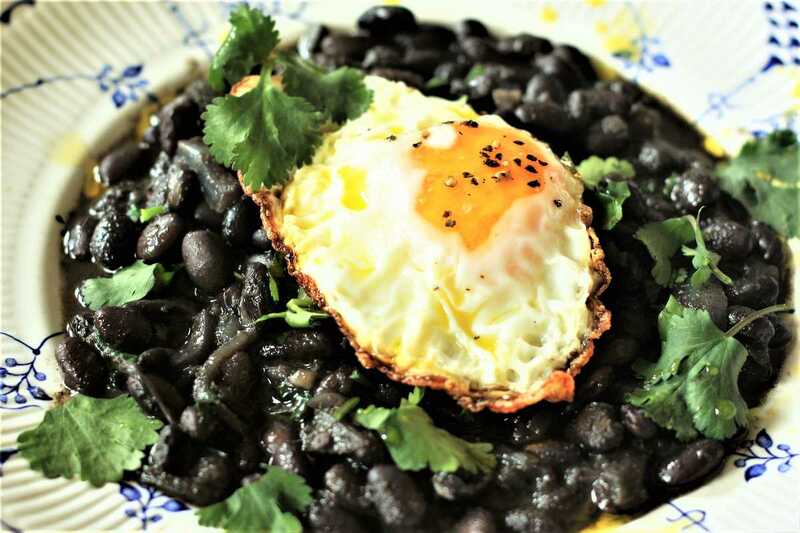 I tried making it with black beans instead of kidney beans and it was even better! I’m not sure exactly what it is about these beans that makes me like them so much. I suspect it may have something to do with the fact that my all-time favourite meal from my local Chinese restaurant is beef and black bean sauce. It’s an umami-rich delight. For this dish, I think they ferment the beans which makes them extra flavorsome. Fermented or not, I believe black beans actually have a deeper, more savory flavour than most other beans. This recipe is a really simple, easy dish that’s perfect as a weekend breakfast or brunch. Nothing more than onion, garlic and some cumin accompany the stewed beans; and to top the egg I have scattered over some rustic chopped coriander and a squeeze of lime. I like to fry the egg until it’s golden and crispy around the edges. It’s a fairly quick recipe; only about 50 minutes of cooking time, however, remember to soak your beans overnight first! Put the beans in a bowl and cover generously with cold water. Leave for 6 hours, or overnight. Place a pan over a medium heat and heat up 1 tablespoon of rapeseed oil. Wait for the oil to get hot, then add the sliced onion and garlic. Turn the heat to medium-low and cook gently for 5 minutes until soft. Drain the beans in a sieve. Turn the heat to high and add the cumin. Stir and fry for 30 seconds. Add the beans along with 450ml water and a generous pinch of salt. Bring to the boil and simmer gently for 40 minutes, until the beans are tender and the water is almost all absorbed. Add more water if necessary. In a frying pan, heat about 1 tablespoon of vegetable oil over a medium-high heat. Crack your eggs in and cook until the white is just cooked in the middle, but crispy around the edges. Before serving, check the beans for seasoning and add more salt if necessary. Add the remaining 1 tablespoon of rapeseed oil and stir vigorously to thicken the liquid. It should be quite thick. Serve the eggs on top of the beans, and scatter the coriander over. Finally, finish with a squeeze of lime juice.